I have been in a writers’ critique group with Ed R. Green for several years, so I was already familiar with and liked the main characters of Hope: The Sapphire Prison, Book One. Terek, a human, and Alora, a siriad, along with Maya and Orendalen, a newlywed elven couple, journey together on a mission of peace. What a delight it was to read the complete story of their adventures as Councilor for Forestwaith and Ambassadors for Solifi. Green does an excellent job of setting the scene. Whether the group is traveling through the Living Swamp or trudging through the desert toward a confrontation with the dragons in the Mountains of Change, the reader is right there with Terek and his companions. Green’s action and battle scenes are also good. What I liked best was the way the different “people” groups worked together to resolve their issues and to bring peace to their world. I loved the chapter titles. The inclusion of a map of the country of Parania was helpful as was the Appendix with pronunciations of unusual names and terms. Green’s fans are eagerly awaiting the publication of the next four books in this series. Thanks, Ed, for a journey into a very different world. How did you develop the unusual lands Parania and Terranil? How flattering. I’m just a historian. During my visits to the planet Mera, I had the honor of interviewing a number of scholars, predominantly in the elven port city of Yahna. Graphic designer Craig Faris did an excellent job with the cover art of Hope, using a portrait photograph by Andy Lawless. That’s a tough one. There have been many. My major influences include the writings of J.R.R. Tolkien, C.S. Lewis, and Leo Tolstoy. I’m in the process of writing Curse of the Illusionist, which involves many of the surviving victors of The War of the Mistress and The Secret War, conflicts I related in The Sapphire Prison series. 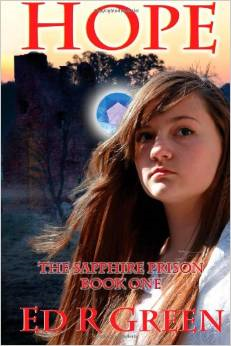 Hope, book one of The Sapphire Prison series, is available at Amazon.com. For the paperback version, go to http://www.amazon.com/dp/1493655833. For the ebook version for Kindle or PC, go to http://www.amazon.com/dp/B00HL5PHPU. Also, you can just go to Amazon.com and type “The Sapphire Prison” in their search field. Hope will pop up. When The Ring of Woodland Stars and the rest of the series is published, they will be available from Amazon as well. For more information about Ed R Green, check out his website at https://edrgreen.wordpress.com.